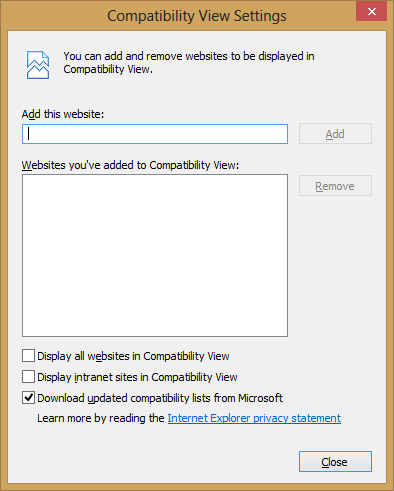 Compatibility View was introduced in Internet Explorer (IE) 8 to help existing content continue to work as it did with IE 7, giving time for developers to update content to support newer web standards. Now, however, most websites are compatible with the most recent IE standards, and will appear to have broken formatting or functionality, as well as unexpected performance bugs, if run in Compatibility View. In order for AchieveIt to display properly, Compatibility View must be disabled.